Living tissue in a variety of shapes can be created programmatically by UC San Francisco researchers. 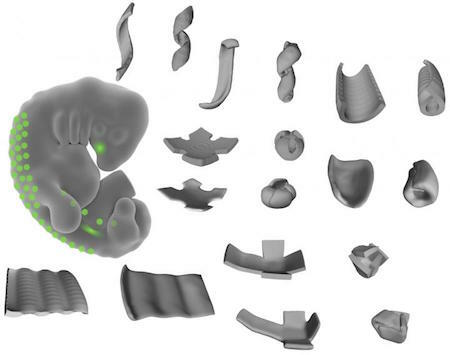 Many of the complex folded and curved shapes that form human tissues can now be programmatically recreated with very simple instructions, UC San Francisco (UCSF) bioengineers report December 28 in the journal Developmental Cell. The researchers used 3D cell-patterning to shape active mouse and human embryonic cells into thin layers of extracellular matrix fibers (a structural material produced by human cells that make up our connective tissue) to create bowls, coils, and ripples out of living tissue. A web of these fibers folded themselves up in predictable ways, mimicking developmental processes in natural human body tissue. The UCSF lab approach instead used a precision 3D cell-patterning technology called DNA-programmed assembly of cells (DPAC). It provides an initial template (pattern) for tissue to later develop in vitro (in a test tube or other lab container). That tissue automatically folds itself into complex shapes in ways that replicate how in vivo (body) tissues normally assemble themselves hierarchically during development. “This approach could significantly improve the structure, maturation, and vascularization” of tissues in organoids” (miniature models of human parts, such as brains, used for drug testing) “and 3D-printed tissues in general,” the researchers note in the paper. ...now life, with all its infinite possibilities, had come to Rama. If the biological robots were not living creatures, they were certainly very good imitations. No one knew who invented the word "biot"; it seemed to come into instant use, by a kind of spontaneous generation. The term was used to describe creations like the spider tripod robots that Rama seemed to spontaneously generate for self-cleaning whenever an energy source (a sun) became available.